Do you have a routine you follow when traveling? Do you like to check out the local coffee shop or taste signature street food? Some activities like climbing to the tallest place for the best view, or joining a local walking tour can give you a great introduction to a new place. A reader once told me that she loves to look at the graffiti of a city and visit a library. 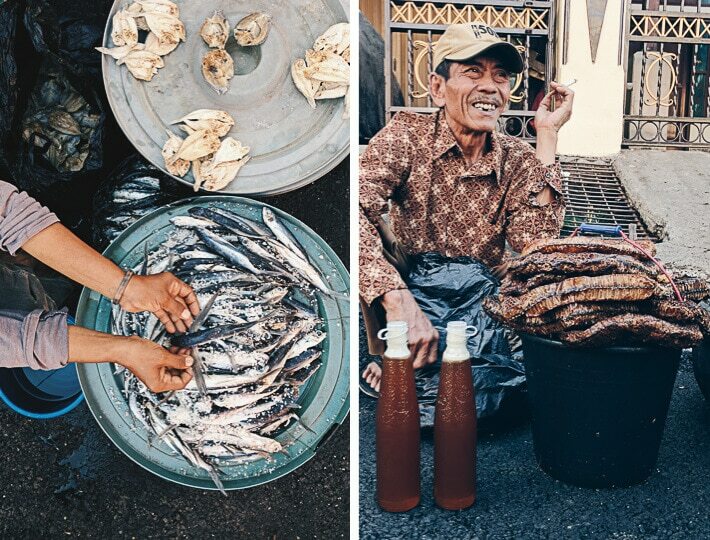 After I attended the Crafting Culinary Stories Workshop in Siem Reap Cambodia hosted by photographer David Hagerman and travel writer Robyn Eckhardt, I fell in love with the morning market and I added it to my must-do list whenever I visit a new city. 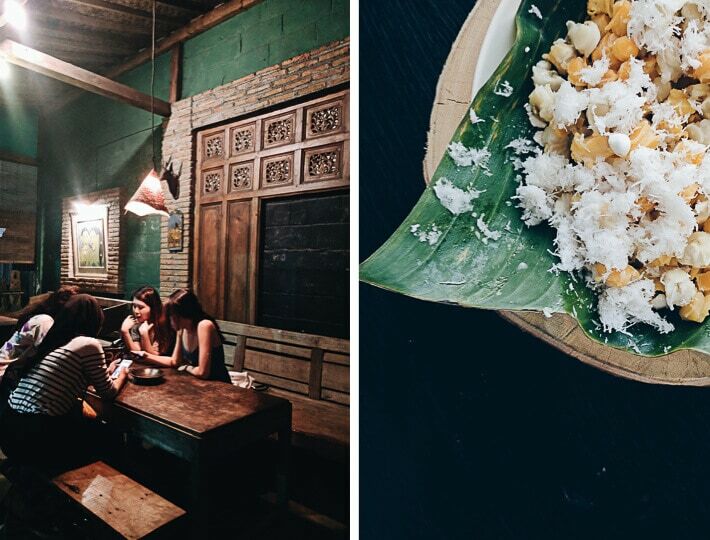 It is the place where you can interact with locals and understand what they eat. 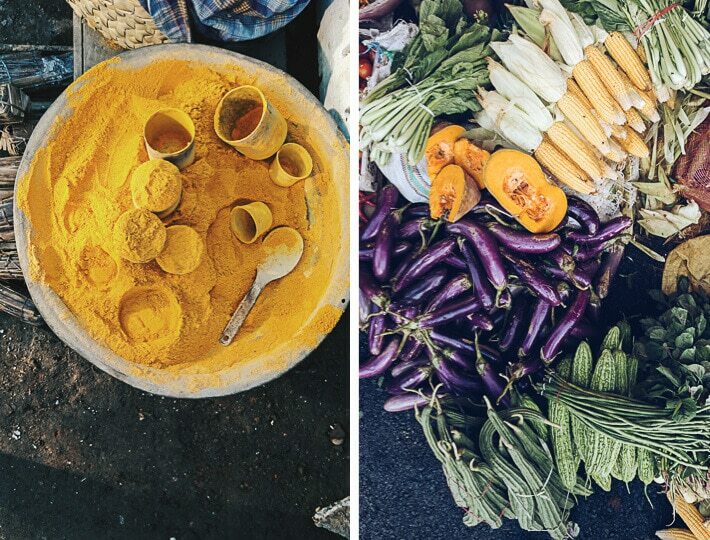 The colorful produce, the fragrant herbs and spices, the delicious smells from food stalls, the crowd, and the buzz. A market energizes your spirit and makes your day start off happy. Not to mention, waking up early to soak up the sun is the best way to beat jet lag. 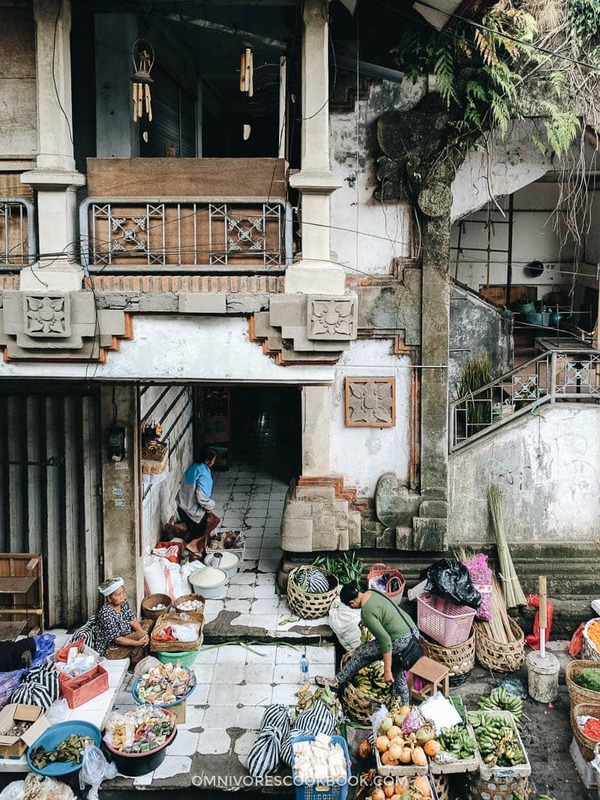 When I traveled to Indonesia this September, I was lucky enough to visit multiple cities and go to quite a few markets. I learned about the giant stinky beans, tempeh, the various tomatoes used in sambal, flying fish, and banana flowers. And I got some treasures at a bargain, such as kitchen knives and cutting boards. I was so impressed with how nice and friendly local people were. No matter whether I was asking for a sample to try or asking a vendor if I might take their photo, they always responded with a gentle smile and a nod. 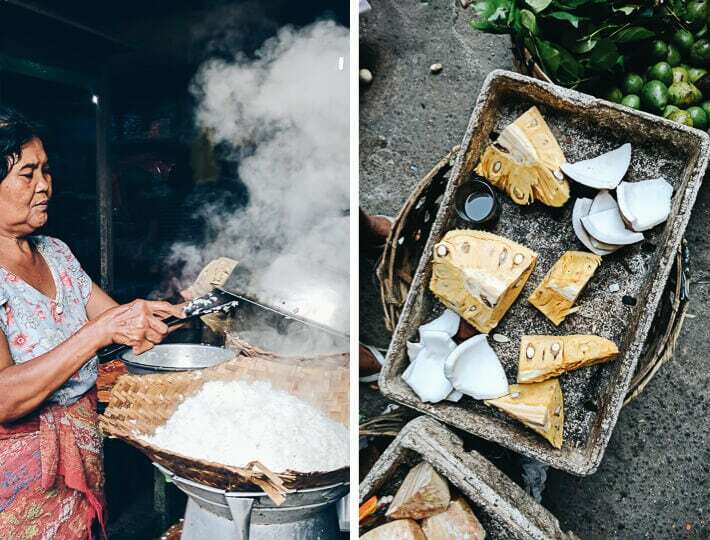 In Indonesia, each market is so different depending on the region. The layouts, how people dress, the produce, and the food, you always discover something new. My favorite markets were the ones in Ubud and Makassar. 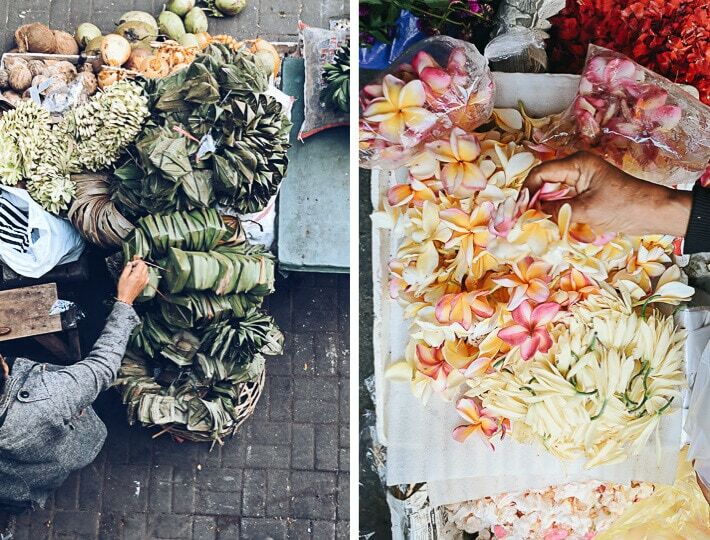 At the Ubud market, you will see so many fresh flowers, religious ornaments, and exquisite local crafts. 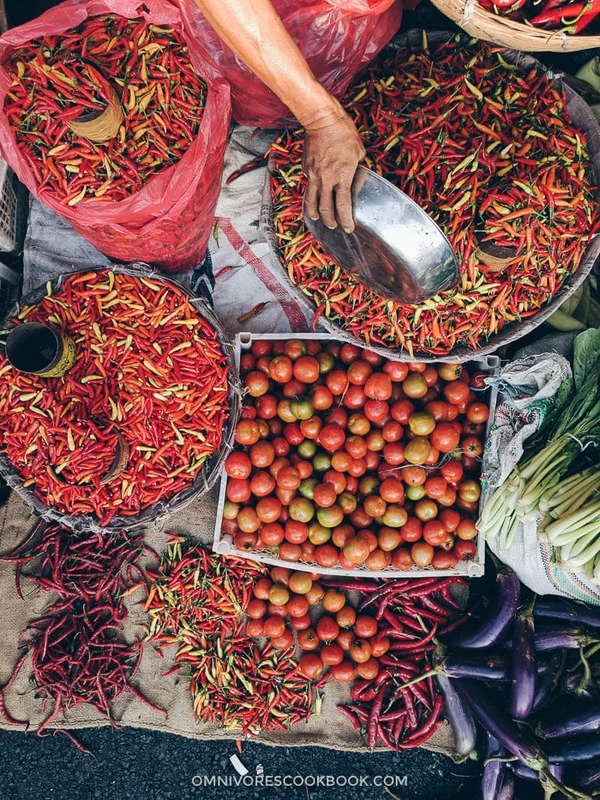 In Makassar, you will see interesting local produce that’s bursting with color and aroma. 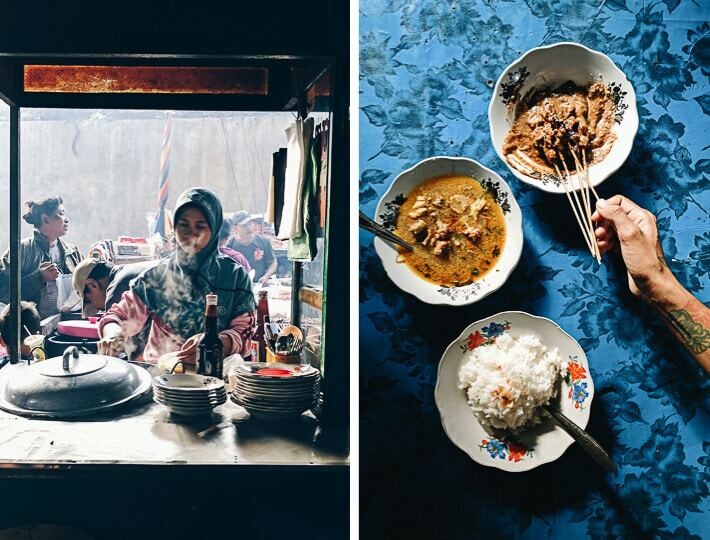 I tried the satay (chicken and beef skewers with peanut sauce) and a lamb soup curry at the Ubud market. Oh my, it was one of the best curry dishes ever! I also discovered a bottled green drink loaded with herbs and vegetables, which was super close to a green smoothie in the US. 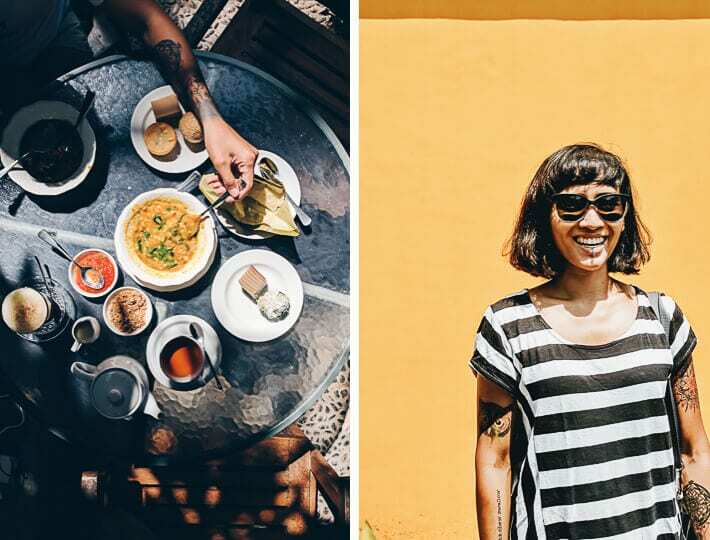 It was a must-have after overeating on local food throughout our way across Indonesia! Below I’ve listed the markets I went to in different cities in Indonesia. Note, most produce markets open very early, at 6 or 7 AM. If you’re interested in food and produce, definitely go there early. Not only will it be cooler to walk around, but you will also find the produce much more vibrant and fresh. Most night markets close at 11 PM, but you should always go there before 10 PM, before the vendors start to pack up in anticipation of finishing the day. 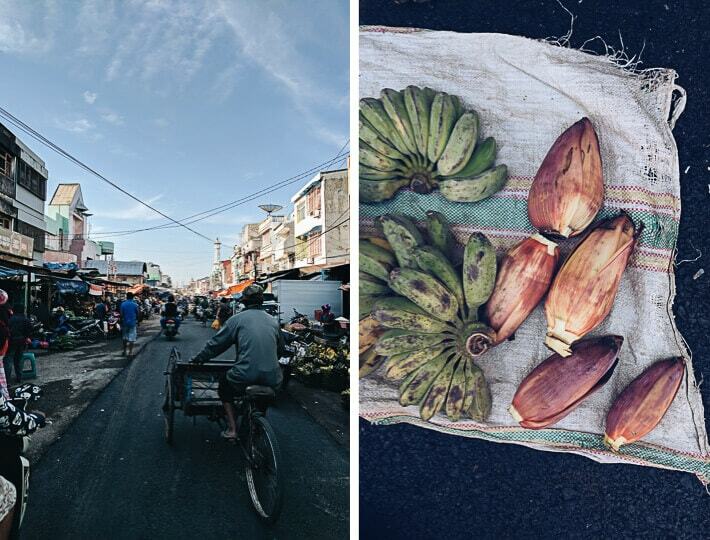 My Indonesian market tour wouldn’t have happened without my wonderful local guide Ade Putri. 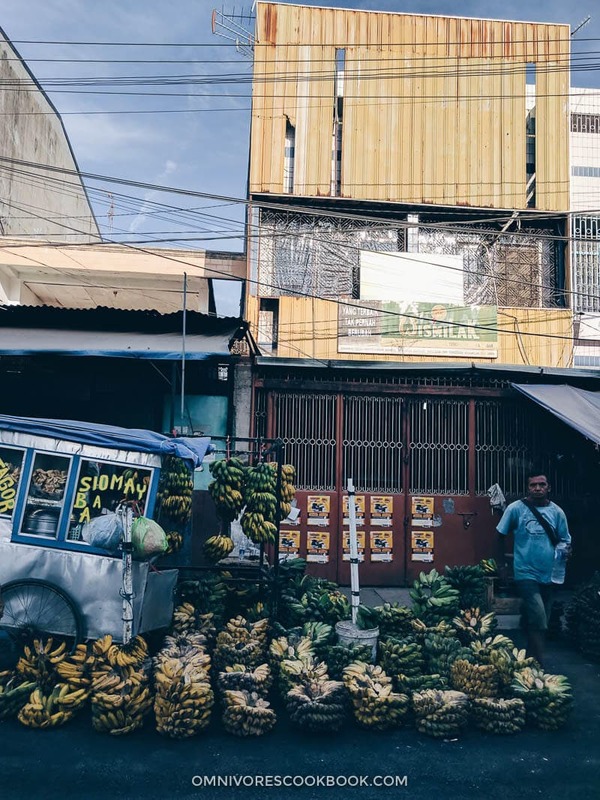 During our trip, Ade researched the places and found out the biggest market whenever we traveled to a new city. She also helped me arrange cars and nudged me to wake up early, even when I felt lazy. At the market, she pointed me to the special local ingredients and food to try out. 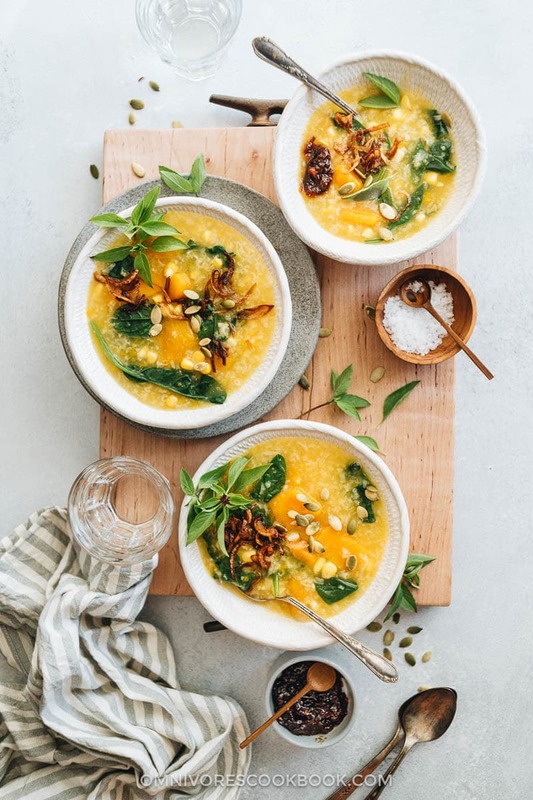 It was during one of these market visits that I came across this beautiful pumpkin porridge, also called bubur manado, Manadonese porridge, or Tinutuan. After our morning market excursion in Makassar, we went for breakfast at the famous bakery Mama Toko Kue. We tried out various sweet snacks, kopi telur (unfiltered coffee with foamed egg yolks), and the breakfast porridge. Ade told me that the local name of the porridge literally means “throwing in whatever grows in your backyard”. Sounds so fresh and seasonal doesn’t it? 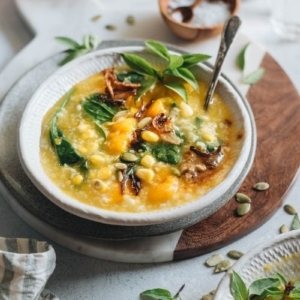 The porridge is usually made with rice, squash, and corn, and is seasoned with lemongrass or ginger. Then you can throw in some seasonal greens. I thought this one was the perfect fall dish to share with you guys, so I tried to recreate the recipe when I got back to the States. Although I used the Instant Pot to make this recipe, you can easily make it on the stovetop, as well. In fact, it won’t affect the prepping and cooking time very much, considering you need extra time to heat up and release the pressure from the Instant Pot. However, the biggest benefits of using a pressure cooker are (1) you won’t need to constantly monitor the pot and (2) the pressure will release more starch from the grains, so you can get a stickier texture that you otherwise wouldn’t get from stovetop cooking. I used to hate cooking with squash, because it’s so tough to hack it and I always end up with a bloody finger. Then I discovered this magical method – microwave the squash for 2 to 3 minutes. You’ll be surprised how easy it is to slice the squash once you heat it up a bit. 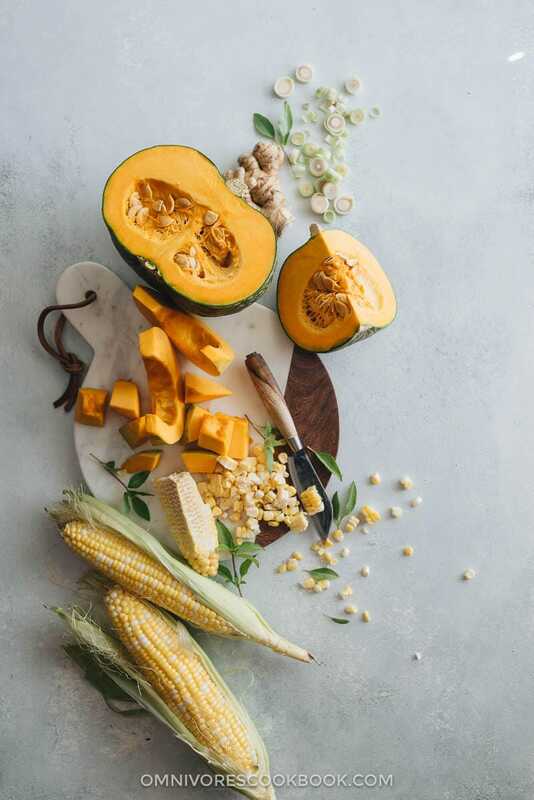 Be careful when using this method, as the surface of the squash will be lukewarm after microwaving, but the interior will be hotter and release some steam when you slice through it. 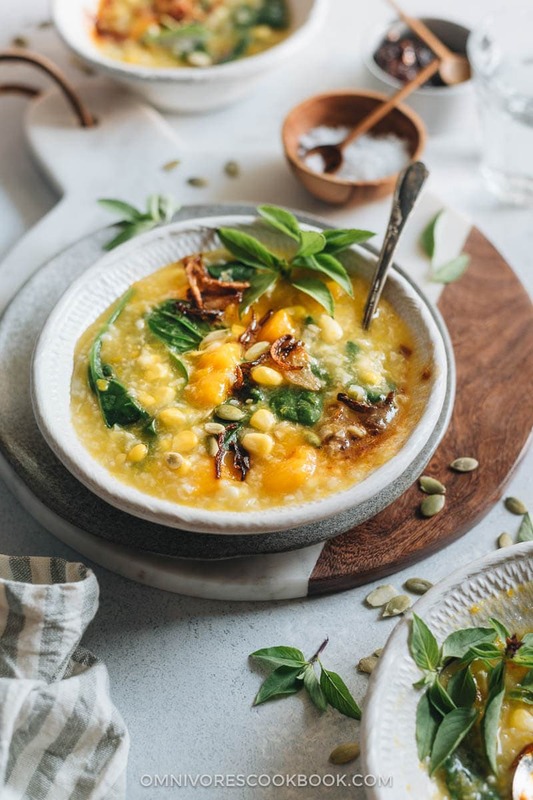 Although I’d totally drink the plain porridge without complaining, you’d be surprised how good it becomes once you add a scoop of sambal – a fermented chili paste that is slightly fishy. If you don’t live close to an Asian market, check out the Thai Kitchen Chili Paste from WholeFoods or order it from Amazon. It has a much sweeter taste than the authentic sambal paste, but it works perfectly in this porridge. Full disclosure: this post was done in partnership with Trip of Wonders 2017 and I was hosted by the Indonesian Ministry of Tourism for the entire trip. All thoughts, ideas and opinions are my own. Prepare for at least 20 minutes of pressure releasing time when using a pressure cooker or Instant Pot. You can also use a normal pot to cook this recipe. Please see footnote 2 at the bottom of the recipe for instructions. 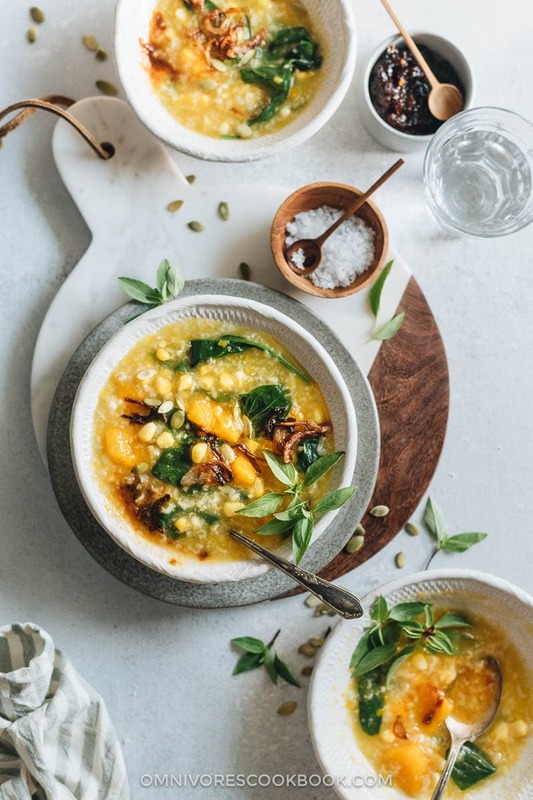 If you do not have kabocha squash, you can use pumpkin, acorn squash, or butternut squash instead. You can also use a normal large pot to cook this recipe. Simply add the rice, 10 cups water, and lemongrass into the pot. Once boiling, cover the pot halfway and simmer over low heat for 40 minutes. Add the squash and cook for another 15 minutes. Lastly, add the corn and cook for 5 minutes. The porridge will get thick at the end of cooking (during the last 10 minutes or so). Constantly stir the porridge so it won’t scorch on the bottom of your pot. Do NOT use fast release when the porridge is cooked, because the hot thick porridge is very starchy and will burst out through the air valve. It is dangerous to use fast release. Note, not all sambals are vegetarian. Check the ingredients if you’re following a strict diet. I just made this porridge but added a bit of tamarind paste which gave it a bit soury tang. My home-made sambal and fried onions finished it off! Thanks for the recipe. The Indonesian buburs are really tasty. My mother used the make bubur ayam (chicken porridge) when I had the flu! Hi Claudette, I’m so happy to hear you’ve cooked the recipe and enjoyed it! Great idea of adding tamarind paste. Did you make it yourself? I will keep an eye on it the next time I visit the Asian market. I love the chicken porridge too, with a handful of spinach. Yum!